FIFA has started a task force referred to as the “Task Force Football 2014” and the committee will attempt to improve World Cup soccer in several ways. FIFA president Sepp Blatter has expressed several times that he wants “a more attractive World Cup” meaning that the tournament needs better officiating and more goals for the global viewing audience. Blatter has made some bizarre suggestions into improving the often slow pace of the early matches of the tournament by potentially disallowing draws next Cup and forcing teams to go to a shoot out following the 90 minutes of action. The change would result in teams being forced to produce more in the early matches of the tournament and would change the entire dynamic and strategy of many of these teams in the opening round. 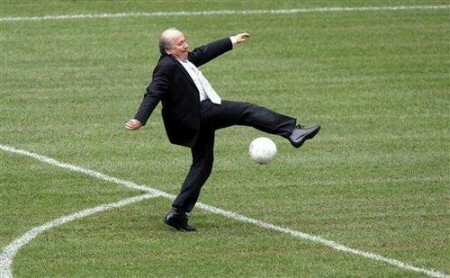 Blatter has also considered adding more officials to the matches to serve as goal line judges and the majority of the committee has voiced their disapproval towards goal line technology as one former president referred to it as “robot soccer”. This to me is the biggest thing that FIFA needs to fix because teams shouldn’t be robbed of goals (or blatantly offsides scoring goals for that matter) because the refs weren’t in the proper position to make the call. Hopefully goal line technology and video review receives some consideration during these FIFA “Task Force Football 2014” meetings because the system truly is the only way that ensures the calls are correctly made. Also I love the catchy name that FIFA has come up with “TFF 2014”. Sounds like a great name for a TV show. But then again I prefer the ladies of the “Fox Force Five” task force rather then FIFA’s “TFF 2014” anyway because the “Fox Force Five” is of course the pilot episode that Uma Thurman’s character from Pulp Fiction apparently starred in about foxy chicks brandishing cool weaponry. Fox as we’re a bunch of foxy chicks. Force as we’re a force to be reckoned with. Five as there’s one … two … three … four … five of us. Now that would be one task force group that every FIFA official would listen to and respect and they would certainly make the World Cup much “more attractive” then what the current corrupt officials bring to the table by selling away votes on the black market and taking money under the table. If Blatter were to bring in these five vigilante women to detect and weed out the corruption within the committee then FIFA would never have to worry about corruption in their organization ever again. Problem solved and beautiful women involved. Sounds like the right task force to me. I think we might be on to something here FIFA…..